“As May Day approaches 80-year old Arthur Tullett wonders how many of his school friends in this faded 1911 picture postcard are still alive. Two of them are – his sisters Alice, 82 and Flo, 78, who both live in Brighton. 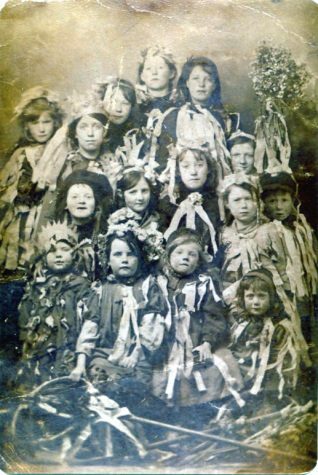 Arthur was about nine when the picture was taken of youngsters celebrating after their Maypole dancing at Circus Street School, Brighton. He now lives with his wife Lillian in Craven Road. The old school building is still there, beside the fruit and vegetable market at the bottom of Edward Street. Arthur says most of the youngsters at the school were from Brighton’s fishing families, including the Rolfs, Taylors and Dines families. Arthur and his school friends had to leave the classroom early in those days. He was earning a living at the age of 12 selling daily newspapers and the Evening Argus in Castle Street. He subsequently worked in the building trade and was a scaffolder until he retired. And where’s Arthur in this nostalgic photograph? He’s the anxious looking little fellow with the cap underneath the Maypole. It was his job to carry the Maypole for the girls to dance round. He is standing next to one sister, with the other behind”. After reading the article back in 1982 I contacted Arthur because he mentioned my maternal grandmother’s name of Dine, he kindly gave to me the original photograph that was used in the Evening Argus article. Obviously Arthur and his sisters have now passed on but the school building is now an annexe of the University of Brighton as can be seen in the photograph below. Lovely photograph. It always surprises me how big an event May Day used to be. 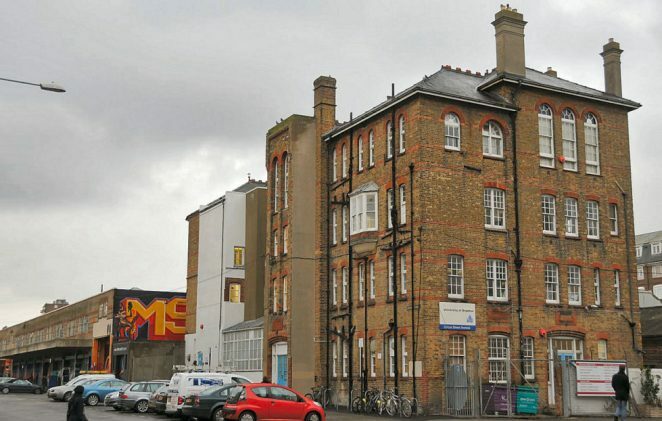 Brighton Museum holds a view of the school from the late 1930s, shortly before much of the surrounding area was demolished in 1937: http://rpmcollections.wordpress.com/2010/09/08/image-of-the-month-2/. Although taken some 25 years after the May Day photo, I imagine the school would have looked much the same in 1911. Thanks for the link Kevin – very interesting! My Dad, who is still alive and will be 100 in November was a pupil at this school and later in his life had a connection with the market. He was a partner in Welfare’s Greengrocers Shop which was on the corner of Blaker St. and Edward St. and would go there for produce. Later, after he left there he became a partner in Henley and Wickham in Haywards Heath/Cuckfield and still in the greengrocery business, still using the market to get produce. Sadly my Dad, Humphrey Wickham, former pupil at Circus Street School, passed away on the 16 May 2015 aged 101.